6 singes or 5 couples max Rates higher during holidays. 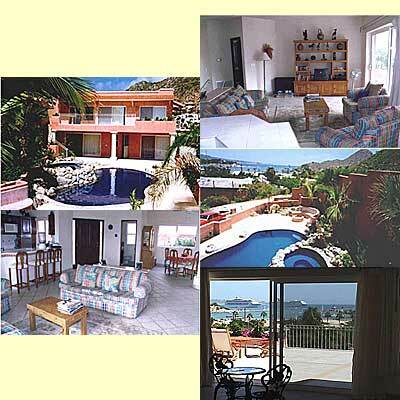 Located in center of Cabo just inside Pedregal. Only one block to the marina; walking distance to beaches, nightlife, shopping, dining and fishing docks. The most convenient and best home location in Cabo! 3000 sq. ft. 4 bedroom, 3 1/2 bath with sep 1 bedroom apt. * Available dates fill up quickly. Rates are higher during holidays. Refundable security/damage deposits required on home rentals plus tax. Limited to 6 singles or 5 couples max, plus tax. Charters from $225 to $885. Includes crew, fuel, all tackle, dispatch fees, ice. *Air, transfers, tips, meals, drinks & fish filleting are not included. Rates & Packages subject to change without notice.Restrictions may apply. Please call for rates on custom packages.